The Undoctored Low-Cost Health Insurance Project is a critical part of our mission to demonstrate that substantial health improvements can be achieved independent of the healthcare system and to lower health insurance costs for our Members. Aggregate statistical data will be shared to help design low-cost health insurance policies based on the demonstrated power of the Undoctored Program to prevent chronic diseases and reduce the need for costly drug therapy and medical procedures. Consult the "Help and Instructions" tab for additional information. Enter the approximate date you began following the Undoctored Program. Clicking the button above will submit only Health Data entered on this tab. You must click the "Submit Data" button at the bottom if each tab you wish to submit data for. Individual data is kept confidential and does not contain personally identifying information. All data submitted becomes the property of the Undoctored website. Clicking the button above will submit only Symptoms Data entered on this tab. You must click the "Submit Data" button at the bottom of each tab you wish to submit data for. All data submitted becomes the property of the Undoctored website. Individual data is kept confidential and does not contain personally identifying information. Clicking the button above will submit only Drug Data entered on this tab. You must click the "Submit Data" button at the bottom of each tab you wish to submit data for. The Low-Cost Insurance Health Project data collection tool provides a means of collecting general Health, Symptom, and Drug information referred to below as "Data Items." The Data Items are grouped on three separate tabs titled "My Health Data" (e.g. Weight, Blood Pressure, etc. ), "My Symptoms" (e.g. Headache, Nausea, etc. ), and "My Prescription and OTC Drugs" (e.g. Cholesterol or Blood Pressure Lowering, etc). It is not necessary to enter every requested Data Item nor at every requested interval. You may make entries as desired and at your discretion. Of course, complete data entered at regular intervals will improve the ability to reach our goal of developing low-cost insurance policies for our Members. While you may enter data at any time, it is preferred that it is entered only at the suggested intervals (usually 30 to 180 days depending on the Data Item). New data cannot be entered more than once per day. Data Items re-entered on the same day will overwrite any value entered earlier in the day. You must enter a date for every Data Item you enter (the default date is the current date). You may change this date to reflect your best estimation of when a Data Item was obtained, a symptom was first noticed, changed, or resolved, or a drug was started or stopped. You may enter past dates to record older data you may have but you cannot enter future dates. Click the green "Submit" button at the bottom of each tab after entering all desired dates and values. Note that the Submit buttons submit only data for that tab. You must click the Submit button at the bottom of each tab you wish to submit data for. A "Success" popup window will appear if your data was successfully submitted. Click the "X" icon in the upper-righthand corner of the Success popup to close it. The "When to Update Next" column indicates the suggested time remaining before updating each Data Item. If you have not yet entered a value for a Data Item the message "Enter starting value" will be displayed. Once the recommended update interval is exceeded the message "Time to update" will be displayed. These messages are only guidelines. You may enter data at any time. Note that the time remaining displayed for updating is based on the latest date among all values entered for each Data Item. The "My Charts" tab will display your 12 most recent Health Data and Symptom entries as line graphs. To change the value of a previously entered Data Item, enter the original entry date of the Data Item, enter the new value for the Data Item, then click the Submit button. Before entering your first-time starting values, review the information requested on the first three tabs and assemble any of the requested test results and prescription drug information you may have available. It is not necessary to provide data for every requested Data Item. You may always enter additional information at a later date. It is very likely your initial data was obtained on multiple dates and often weeks or months in the past. For each Data Item, enter the actual or approximate date the test data was obtained, the symptom began, or the drug was started. As described in Item 7 of the General Rules of Data Entry above, you will be prompted as to when an update is requested. Updates can be made any time you receive new test results, new or changed symptoms occur, or you start, stop, or change a drug. Unlike Health Data and Symptoms, Drug data does not have a requested update interval. Enter changes to your drug needs as they occur. The My Health Data tab allows Members to provide 10 items of Health Data initially then again at specified intervals. Follow the steps below. 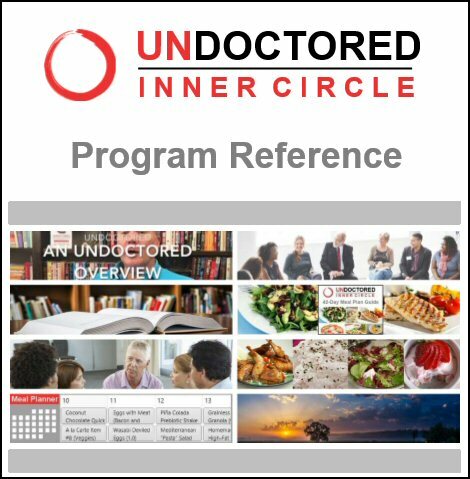 Enter the date you began following the Undoctored Program if you have not already done so. If any of the Health Data you are about to enter was obtained on a date other than the current date, enter the approximate date it was obtained in box provided in the "Test Date" column. For each Health Data Item, enter the requested value in the space provided. Select the units of measurement from the dropdown list provided to the immediate right of the value entered. When a selection dropdown is not provided, you must enter values in the units of measure listed to the right of the value. When finished entering all desired values on the My Health Data tab, click the green Submit button at the bottom of the tab. You can review your last 12 Health Data Item entries on the My Charts tab. If any of Symptoms you are about to enter began or changed on a date other than the current date, enter that approximate date in the box provided in the "Symptom Date" column. For each Symptom, enter the requested value by clicking, holding, then sliding the slider control until the desired numerical value appears in the the grey box to the right of the slider control. If you do not wish to enter a value for a Symptom Data Item leave the slider on "N/A" which means you want to provide "No Answer" (N/A) for that Symptom. When finished entering all desired Symptom values, click the green Submit button at the bottom of the tab. You can review your last 12 Symptom Data Item entries on the My Charts tab. Enter the Total Number of Prescription and OTC Drugs you are currently taking in the box provided. This number may be greater than the number of specific drugs you select in the next step as the list of Drug Types and the Drug Classes displayed within each Drug Type is not comprehensive and may not list a drug you are taking. The second section of the tab allows you to select specific Drug Types you may be taking. For each Drug Type you wish to add, delete, or change data, start the selection process by clicking the text value to the right of the Drug Type (the initial text value for all of the Drug Types will be "None"). If any of the Drugs you are about to enter were started or changed on a date other than the current date, enter that approximate date into the "As of Date" box. Drug Data Items cannot be graphed. However, unlike Health and Symptom Data Items, your most recent selections remain displayed after submission so you may review them. Be certain to edit and resubmit Drug Data Items to reflect any changes that occur with the proper dates and drugs you are currently taking. Remember, there is no suggested interval to update drug information. Enter them whenever they occur. After clicking the text value displayed to the right of each Drug Type, a selection box will appear listing one or more Drug Classes typically prescribed for the selected Drug Type (including a list of generic and brand named drugs in that class). Click one or more of the Drug Classes displayed to add them to your selections list. Click any selected Drug Class a second time to remove it from your selections list. Click "None" to remove all selections. Click the "X" icon in the upper-righthand corner of the selection box to close it and display your list of selections. When finished making all desired selections on the My Drugs tab, click the green Submit button at the bottom of the tab. After submitting data or upon returning to the My Drugs Data tab at a later date, each Drug Type will display your most recently selected Drug Class. The My Charts tab displays a graph of your last 12 entries for all Health Data (if any), all Symptoms (if any), and Total Drugs you are currently taking. Specific Drug Types and Classes selected are not displayed.